They are beloved by fans and despised by NHL league officials. Basically, their job is indeed to be loved and hated. They are (or rather were) hockey’s so-called “enforcers.” They had the backs of their all-star teammates and their efforts were definitely appreciated. Some of the greatest enforcers to ever mix it up on the ice take stock of their careers and the ways the sport has evolved in Brett Harvey’s documentary Ice Guardians (trailer here), which opens tomorrow in New York. Everything they used to say about fighting in hockey was true, but there was more to it than mere testosterone flare-ups. In the 1980s and 1990s, most of the fighting was done by enforcers, who were specifically recruited for their toughness. Sometimes they would pick a fight with their counterpart, in accordance with the unwritten rules, in hopes of sparking the team. 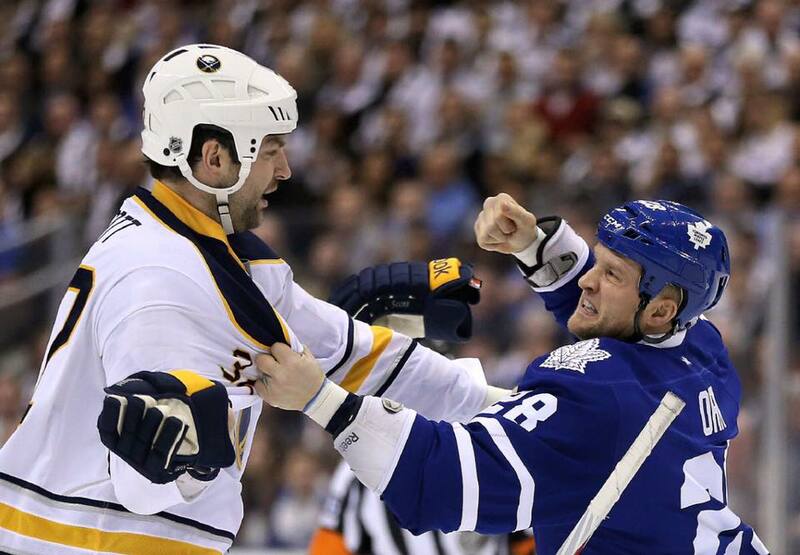 However, if anyone targeted their team’s star player, the enforcer would bring down the hammer. Of course, the League is totally against this sort of privatized justice, so they have changed the rules to effectively prohibit enforcers from enforcing. However, the results are a mixed bag. Wayne Gretzky famously had Dave Semenko and Mart McSorley during his long, healthy, record-breaking career. In contrast, Gretzky’s heir apparent Sidney Crosby has been sidelined for extended periods due to concussion-related issues during the post-enforcer era. Essentially, Harvey’s pro-enforcer analysts argue the McSorleys and Semenkos represent a self-regulating system, which discourages cheap shots. In contrast, the League assumes the refs have perfect knowledge of what transpires on the ice and the prospect of five or ten minutes in the penalty box will be sufficient to protect star players from dirty play. Harvey somewhat stacks the deck in favor of enforcer, but he includes some frequently useful commentary from an official NHL doctor. Still, we definitely get the sense enforcers were scapegoated for every scandal and problem the game faced. Even Dr. Tator readily admits getting checked into the boards at thirty-five miles per hour has much greater concussion implications than the relatively brief fights. Of course, Guardians isn’t all serious. In fact, the greater portion of the film is devoted to anecdotes and nostalgic war stories. There are some big hockey names reminiscing about how the game was played in their day, including “skills” players Bobby and Brett Hull and Chris Chelios, as well as enforcers like Semenko, Brian McGrattan, George Parros, Scott Parker, Kevin Westgarth, Todd Fedoruk, and Dave “The Hammer” Schultz. You’d better believe they all have some stories to tell, so you really ought to listen. Ice Guardians is a ton of fun, but it also offers some genuine insights into sports psychology and human nature at its most elemental. Clearly, it loves the game, but not the NHL—and its biases are contagious. 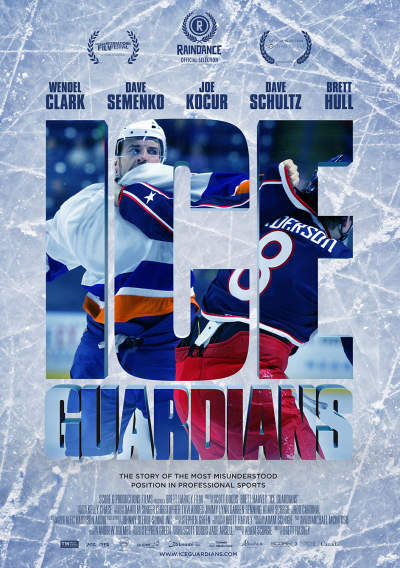 Very highly recommended for all sports fans, Ice Guardians opens this Friday (10/28) in New York at the AMC 34th Street and in Colorado at the AMC Westminster Promenade.